The first route at Český Krumlov Castle is focused on the original castle interiors from the Ranaissance and Baroque periods (16th - 18th centuries). 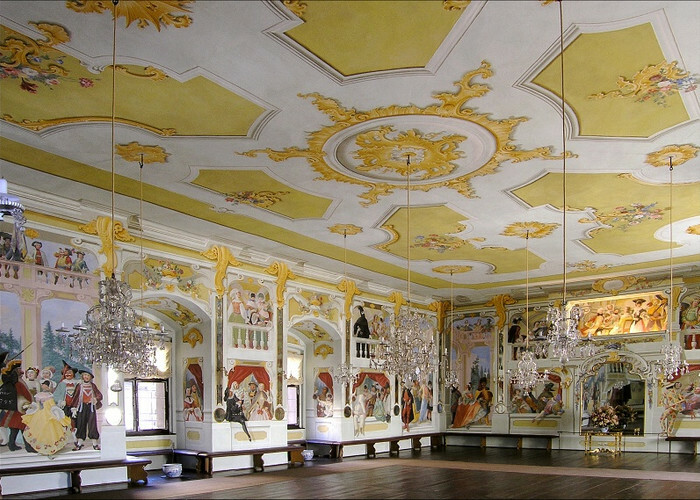 It includes among other room the Castle Chapel of St. George, Eggenberg Hall with a "golden" carriage and Masquerade Hall. 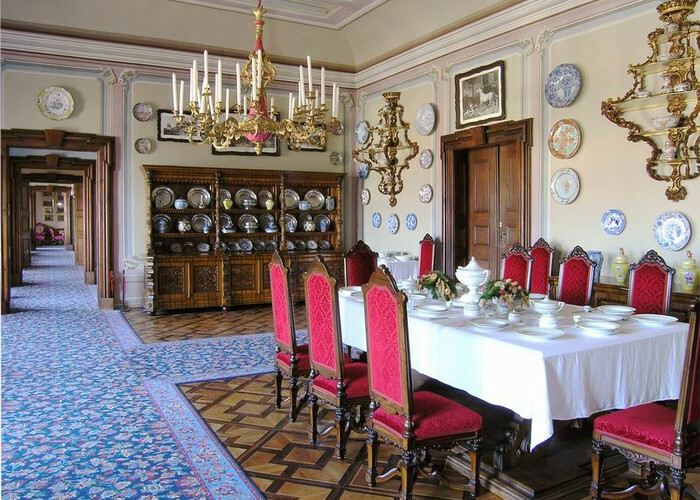 The second tour route at Český Krumlov Castle focuses on the history of the Schwarzenberg family. It begins with a visit to the Schwarzenberg portrait gallery with paintings of members from the forefather Erkinger up to the early 20th century, and ends with a tour of the corridors of the "Cloak" Bridge. Baroque Theatre at Český Krumlov Castle is the best preserved Baroque Theatre in Europe, in its original building and with orchestra pit, stage, machinery, sets, librettos, props, costumes etc preserved. 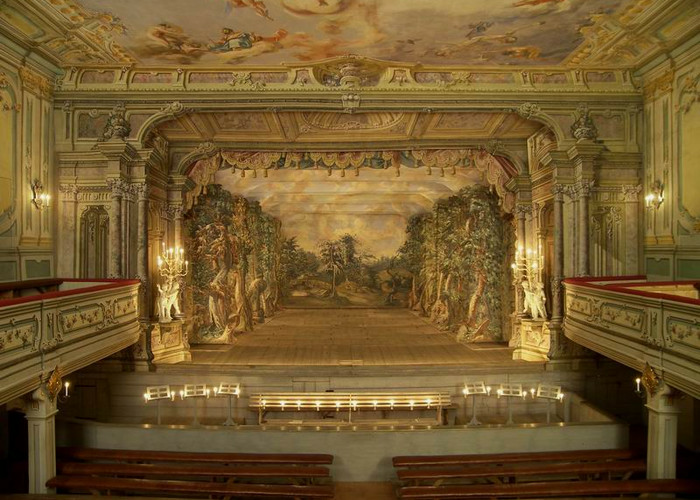 Due to its delicate restoration, the Baroque Theatre has become a unique complexly preserved historical sight. 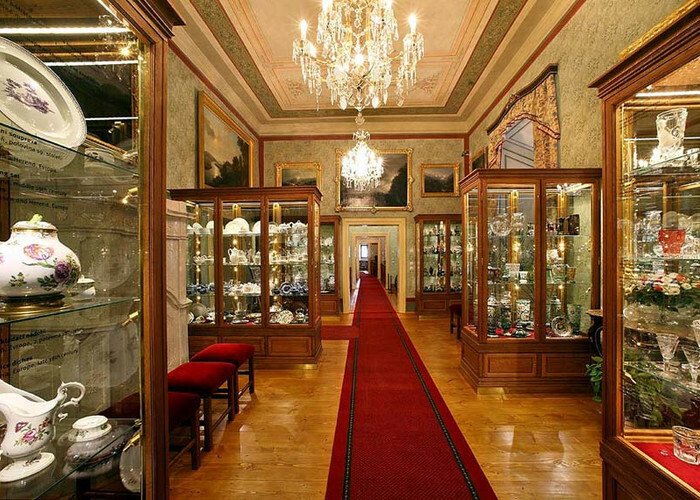 The new Castle Museum exhibition was opened in 2011 by the National Heritage Institute. Museum visitors have a unique opportunity to peek into the secrets of the castle depositories relating to the most important events connected with the Rožmberk, Eggenberk and Schwarzenberg owners of the Krumlov estate. Entry to the Castle Museum exhibition is individual, without a guide but with the option to rent an audioguide. This rounded six-storied tower, surrounded by the residential palace of the Little Castle, is situated on a narrow rocky promontory towering above Latrán and the Vltava River between the Ist and IInd Courtyard of Český Krumlov Castle. The origins of this structure are partly Gothic and partly Renaissance, as is evident from the tower's external appearance. The tower as well as the Little Castle is a segment of a structure dating from the first half of the 13th century. Castle Tower The oldest part of it is the groundfloor and first floor. The origin of the second floor is around the 14th century, while the third floor is part of the Renaissance belfry. We can not eliminate the Gothic origin, however, due to the bell dated 1406. Under the architect Baldassare Maggi of Arogno, the castle was remodelled and converted from a plain Gothic palace into a Renaissance residence, and the tower was provided with an arcaded gallery at the top in 1581. In 1590 the tower was decorated with mural paintings and figural and architectural motifs by Bartoloměj Beránek - Jelínek. In 1947 an ambitious reconstruction of the tower was realized. 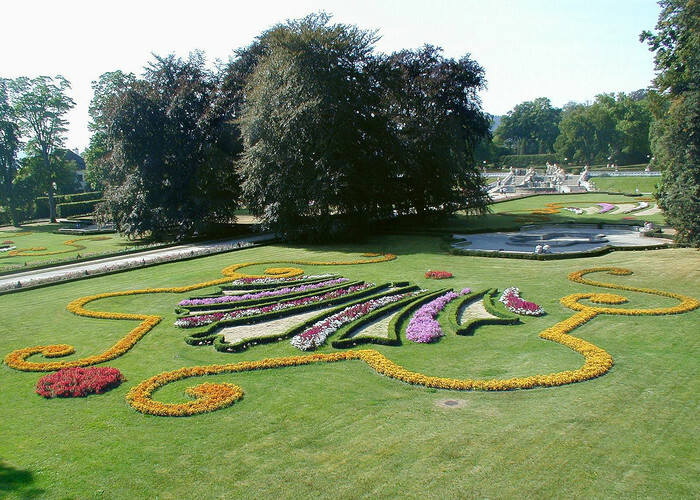 In 1994 - 96 the paintings and murals underwent reconstruction as well. Castle TowerThe Tower is the symbol of the town of Český Krumlov, of its history and beauty. It is "The towerest of all towers" as once characterised by Karel Čapek. The tower is publically accessible and offers a beautiful view over Krumlov and surroundings. 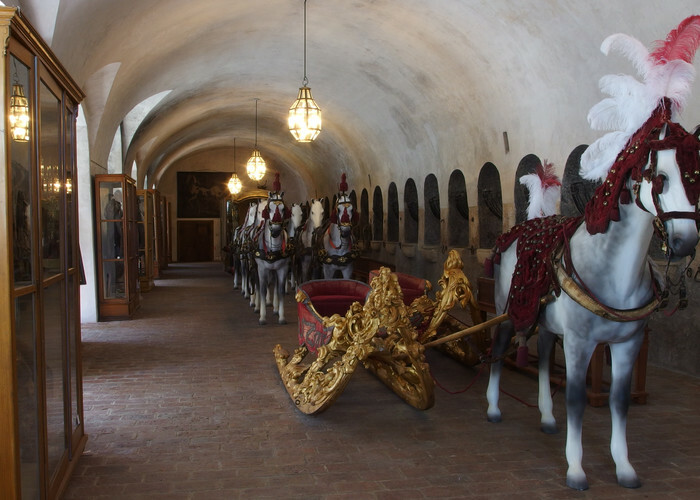 The Baroque horse stables with barrel vaulted ceilings was built on the ground floor of the Renaissance House by the Schwarzenberg builder F. J. Fortini in 1750´s. The Renaissance House is located on the Vth Castle Courtyard where it sits against the western wall of the Catle Theatre. The Baroque horse stables represents the most significant architectural element of the Renaissance House. At the center window you can find a richly ornamented Baroque water trough. The wall on the opposite side of the stable is regularly divided by 22 niches with stone-sculpted mangers. The historical transformation of the Baroque horse stable was finished. Various valuable textile, leather and metal exhibits were slowly researched, completed, conservated and restored and later gradually relocated into the stable.